What’s the value of a can of Ensure? Spam? Or a pack of Doritos or other snack you can pick up during a Target run or at the corner store? Well, if you’re a member of the Filipino diaspora, everyday items, snacks and other treats can have additional meaning attached to them if they’re shipped to the Philippines from abroad in a Balikbayan Box. It’s a tradition I had no idea about until a year or so ago. It was then I realized that—among all the groups of color I grew up around in Los Angeles—there are some folks whose traditions I’m more familiar with than others. I don’t pretend to know everything about anyone, but as an eternal student, learning as much as possible is a constant goal. It dawned on me last year that I knew next to nothing about the Filipino diaspora and Filipino Americans, and wanted to learn more. This-here interview was released last year, and was so interesting I wanted to share it again this year! So if you’ve heard this before—welcome back, and stick around. 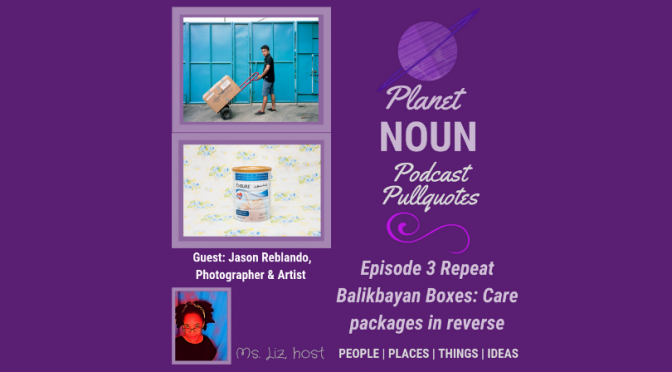 If you’re hearing this for the first time, let’s dig into this holiday repeat of Planet Noun Episode 3—Balikbayan Boxes: Care Packages in Reverse with Illinois-based artist, photographer and author Jason Reblando. Happy holidays! Merry Christmas, Happy everything! Take a listen to a holiday repeat of Episode 3, with guest Jason Reblando. He’s an Illinois-based artist, photographer, and author. Jason joined me on Skype. This has been a holiday repeat of Episode 3 with guest Jason Reblando, an Illinois-based artist, photographer, and author. He was on Skype. Here’s a link to Jason’s article about Balikbayan Boxes on City Lab. Learn more about Jason, his book projects and artwork on his website.